SME (Small and Medium-size Enterprises) promotion has recently become “the order of the day” not only within the private sector, but also among government bodies and development institutions alike, as there are claims that SMEs contribute significantly to economic growth and development through job creation among others International LabourOrganization (ILO) (2013:8).This suggests that promoting SMEs against failure could serve as a tool to achieve sustainable and inclusive growth. For pro-SME advocates, SME failure is mainly due to lack of access to short and long term loans. 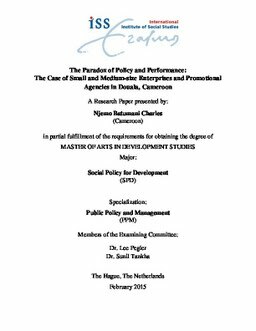 This paper critically examines and analyzes findings on the relationship between the performance of SME Promotional Agencies (PAs) guided by policy norms against what SMEs say they need in the case of SMEs and PAs in Douala, Cameroon (CMR). In doing so, the paper uses mixed methods of data collection, the concept of Good Governance (GG) and the principalagent theory to further explore this relationship. Analysis of the findings reveal that SME failure could be as a result of high-level informality, corruption and poor governance (lack of participation of SMEs in decisions that affect them) which could adversely affect the overall performance of SME PAs, hence, having mismatches of what PAs provide against what SME say they need which could be termed "The SME - Agency Paradox." Hence the paper proposes the need for sustainable strategies to policy makers on how to bring informal enterprises to formal economy since the latter constitute a significant share in Douala, CMR.